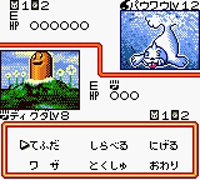 Pokémon Card GB2: GR-Dan Sanjō! The Pokémon TCG Master Mark is joined by a female hero, Mint, as they face off against the Great Rocket card thieves. Build your deck from the cards that remain after the theft and set out to challenge the Great Rocket leaders. Set a Pokémon card and build its strength with Energy cards to allow it to use stronger attacks or evolve. Take out your opponent's deck to win the battle and their cards. You can also trade with other copies of the game to improve your deck. You can also	practice	your deck strategies in the game before taking them into battle.